no body will ever see the camera... is perfect!! 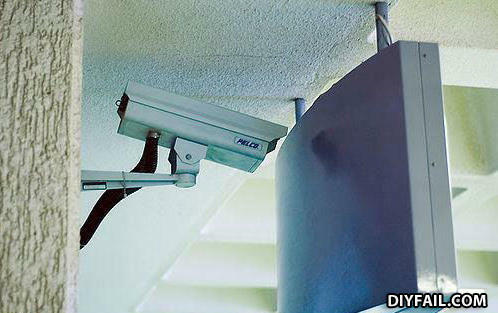 No robber will think to look for the camera here! you wouldnt know this upon first glance, but that camera has x-ray vision. This needs to be on Pointless Inventions! "What's on screen?" "Blue as always" "ahh... great the sign is still there"
Such thing as "Hidden Cam". I said conenct it to the moniter! Not put it behind the moniter! What is purple and green at the same time? Grapes, I lied about at the same time.